Bitcoin is at an extremely important area right now. In about 20 minutes (it is 1741 CST right now), so at 6 PM CST, we begin a new cycle in time for Bitcoin. 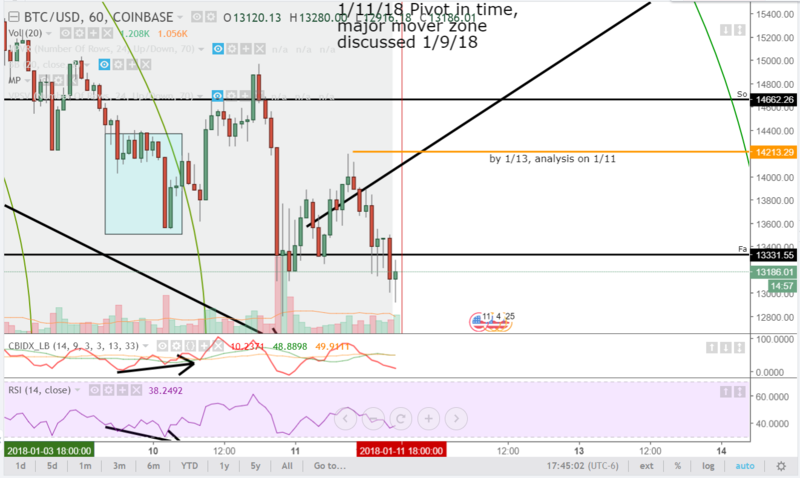 When I discussed the arc that Bitcoin was trading in and how it is not actually a representation of the truth of where price was, we did shoot up to that previous value area but we have continued to move down. I have personally been desiring further movement, maybe to 12500 and down to maybe the 8,000 level. However, this current area around the 13000 to 12000 level is very important. Strong reversals in trend – in this case, a return to the top side. Culminations of moves and then continuations of the previous trend. Out of those two options, reversals happen 78% of the time. The moves don’t have to happen right away. Things involving the market like support, resistance, trendlines, etc are not static. They should all be viewed as having a standard variation and ‘zone’ in which things can happen. For pivots in time, it can take 2-3 days before and after a pivot for the move to happen. Additionally, we have had significant events in time happen over this week. We are approaching areas where the moves need to be made in our previous time zones. This new pivot in time adds to the volatility and the power of the next move. It’s like a concoction of highly unstable ingredients that will begin to feed off one another.